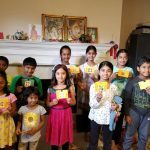 Ms. Brahan and Sri Hari of Richmond wished that Sri Swamiji bless their new homes with His Holy Padukas, and accordingly, a Paduka Pravesham satsang was performed at their new home in the morning of Saturday, April 20th 2013. 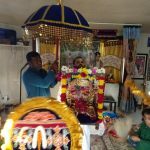 Sri Swamiji’s Padukas were welcomed to their new Richmond home amid Mahamantra Kirtan following which the couple performed Puja to the Divine Padukas. This was followed by Sri Swamiji’s Kirtans. 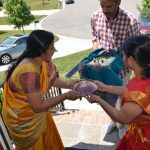 As a part of the Rama Navami Utsav celebrations, Seetha Kalyanam was celebrated in their new residence in the presence of the Divine Padukas. 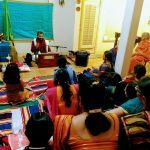 Sri.Narayananji from Boston spoke on how the Divine Padukas were no different from the Lord Himself and they were even greater. 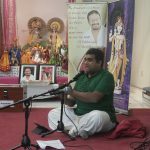 He explained the import of ‘Gruha Pravesham’ and how Gruha Pravesham is truly supposed to be performed. The hosts were blessed with Sri Swamiji’s Prasad. 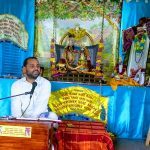 The satsang concluded with Aarthi for Guru Padukas and the divine couple, and all the devotees were fed with sumptuous lunch prasad.